Can Tho (VNA) – As many as 130 charity houses, each worth at least 32 million VND (1,300 USD), were handed over to poor and ethnic minority households in Truong Long commune, the Mekong Delta city of Can Tho on December 15. 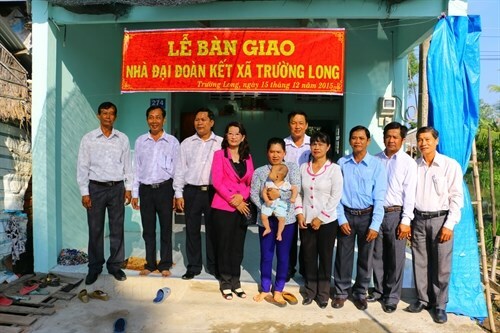 The funding of the charity houses is sourced from the Southwesterm Region Steering Committee, the Bank for Agriculture and Rural Development of Vietnam, and the local fund “For the Poor”, according to the Phong Dien district People’s Committee. The activity, among those to mark the 55 th anniversary of the National Liberation Front (December 20), is part of the plan to present 184 houses to impoverished households in the three communes of Tan Thoi, Nhon Ai and Truong Long. Earlier this year, another 288 hous es, funded by the fund “For the Poor”, were handed over to the local needy households.